Why is my basement flooding? At Sierra Restoration, we hear this question often. Basements are prone to water damage because they are the base of a home and are either built partly or entirely underground. Really, we could blame gravity most of the time for basement water damage. Water flows with gravity and finds its way from the high ground to low ground. When there is room underground, there is a higher possibility of flooding. Okay, so why does your basement flood when it rains? Shouldn’t it be “watertight”? My basement, your basement, your neighbor’s basement can flood. 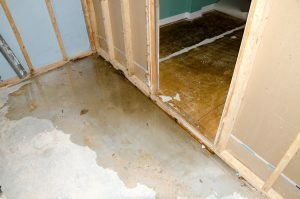 There are several factors in play, and any one of them can result in water damage to your basement. The answer to the previous question can become complicated because there are so many variables out there. Below is a list of a few reasons why your basement may suffer from water damage. If you are asking that question because your basement is prone to water damage, contact a professional water damage restoration company, like Sierra Restoration. A professional team can help you find the source of the water damage and clean up the mess. When water starts to pool around the foundation of your home, gravity pulls that water downward. If there are any cracks, crevices, loose or broken window seals, that water is going to find a way into your basement. Water can pool around your home when your yard isn’t sufficiently graded, your gutters are clogged, or your drain spouts aren’t pointing away from the foundation. We suggest maintaining the exterior of your home regularly to help prevent your gutters from clogging or your downspouts from becoming damaged. Sump pump malfunctions happen more often than you may think. If you have a sump pump installed in your basement, we recommend checking to make sure it is working correctly. You will also want to check with the manufacturer to make sure your sump pump is the right size for your basement. Sump pumps that are too big or small can become overworked and may not perform the job correctly. If a sump pump fails during a heavy rainstorm or the power goes out, groundwater can easily enter your basement through your sump pump. Sewer backups are another source of water damage in Logan basements. When city sewers fill with rainwater they can begin to overflow. Sewage can easily back up into Logan residence’s when the cities drain system becomes flooded. Sewer backups aren’t as common as foundation leaks and sump pump malfunctions, but they do occur when you least expect it. Overflowing city sewer systems can do more than flood your basement. It can cause drain backups, and toilet overflows. This list only covers a small portion of the reasons why your basement can flood. There are also internal sources like a broken water line, a malfunctioning washer, or an overflowing toilet. Hopefully, you find this article helpful. If you have more water damage questions or concerns, contact the professional team at Sierra Restoration! We have seen it all, from water damaged basements to overflowing dishwashers.